For some reason, kids in my neighborhood don’t celebrate Halloween: they do Reformation Day instead. Right around 5, the little tikes start pounding on doors, dressed as characters of the Reformation and absolutely clamoring for people to tell them more about the big event. Especially the six-year-olds do, as their little ear-follicles have just been stirred for the first time, in that year’s curriculum, by the word Reformation, and they are dying to hear the details; some seven-to-ten-year-olds are usually there too, for a little review, and maybe to chip in with a detail or two. Anyone older than that has to help give answers. It’s an exhausting day for me, as you can imagine, because even though all the neighbors do their part, well when the kids hear that an actual professor of Reformation history is lurking behind my 95-theses-covered door they just about break it down. Plus it’s the one day of the year when the doctorly beeper I wear to respond to History emergencies starts going off like crazy, as all sorts of adults are also dying to get their facts straight but don’t want to come to the door in costume. So here’s what’s likely to go down tonight. Me (still dressed the same, and backing up slightly so the growing crowd can hear): Well you heard rightly Jonny; Luther never mentioned any nailing himself, but instead it was his sort of assistant, Philip Melanchthon (knowing nods all around), who wasn’t even in Wittenberg at the time and who mentioned it only years later. But some scholars say that October 31 was the ordinary day in the fall term to nail up theses for disputation, so there was no real need for Luther to have mentioned it, it was just routine. I mean do you mention on Facebook every time you make a phone call? (a majority of heads nod affirmatively). Oh. Well, anyway, what’s certain is that Luther at least started writing letters to bishops in the area on October 31, and that he included copies of his theses in those letters—and then it’s possible that he also nailed them that day too. 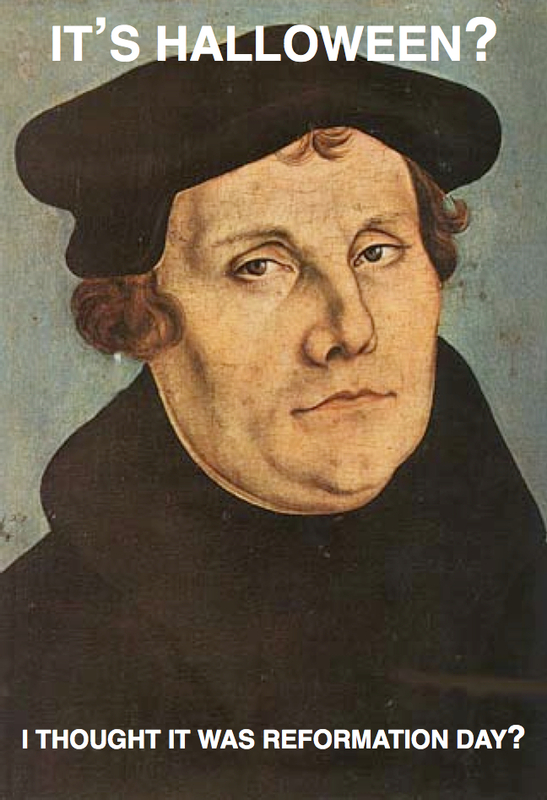 But his best biographer, Martin Brecht (furious scribbling in tiny notebooks), thinks that Luther sent the theses around on October 31 and probably nailed them up only later in the month, especially once all the crowds bursting into the university church to see relics and get indulgences on especially November 1 (All Saints Day) made him start ruminating on the matter more than usual. Anyway, sending out letters and calling for a disputation, by mail or nail, were the first two things a professor would have thought of when trying to solve a problem. Me (putting on my doctor’s hood now, murmurs of awe all around): Well, probably not quite Teresa. It’s true that by October 1517 he was already developing his sense that humans could do nothing to save themselves, and therefore required some sort of justification from God, but exactly how they were justified he hadn’t completely worked out yet. He still believed that it involved some suffering, and what was irritating his monk’s cowl about the way indulgences were being hawked was the suggestion that if you bought one you could practically just eliminate suffering. This made the indulgence seem like a straightforward financial transaction instead of what it was intended to be, which was a sort of capping-off of the process of penance, in the spirit of the Old Testament practice of offering sacrifices of earthly goods as part of the process of atoning for sins. Luther wasn’t the first or last Catholic thinker to criticize indulgences, but his sense of sin and suffering was maybe keener than most people’s, and the casualness of the current indulgence sort of rendered meaningless all the suffering he’d done himself to try to make up for his own sins—all the privies he’d scrubbed and all the prayers he’d said and all the fasting he’d done and all the cold he’d endured and all the six-hour confessions he’d made and all the devil-fighting he’d waged. In other words, at this time Luther was still pretty much a reforming Catholic. In fact a few months later he wrote an explanation of his 95 Theses, dedicated it to Pope Leo X, and even sent the pope a copy, explaining that he’d intended only to defend the pope’s honor, because he was sure the pope wouldn’t have approved of what the indulgence-sellers were doing. Luther didn’t repudiate the whole practice of indulgences until a couple of years later. But Luther’s friends saw better than he did the implications of his criticism, even in 1517: even though Luther claimed to be defending the church, and the pope, his criticism of this particular indulgence was at least an implicit criticism of the papacy itself. Which might explain why no one even bothered to show up for the disputation Luther invited so many people to. University professors could argue just about anything, but that might have been too sensitive for them. Thomas (dressed as the radical Thomas Muntzer): That was my question: what happened at the disputation? Me: Well, nothing, because again nobody came. Oh people were interested, but not the people Luther had in mind. He wanted an academic debate only, among academics, which was why the theses were written in Latin, the language of instruction in all European universities. But some entrepreneurially-minded young fellows saw the potential for controversy in the theses, and had them printed both in Latin and in German, and they started selling like dark German beer during Oktoberfest, ha ha! (no laughter, only much clearing of throats and quick glances back at waiting parents on the sidewalk, because with talk like that, about beer, the kids are afraid they won’t be allowed to keep coming to my house every year). Meg (dressed as Margaret Fell, an early Quaker, a slightly-controversial costume in the eyes of some kids because maybe not early enough in the Reformation as a whole): So did Martin Luther’s 95 Theses bring the world closer to truth? Me (tiny notebooks now really coming out): Well, it depends on what you take as truth, of course. As I said, Luther was still working out himself what he thought was “truth,” especially in regard to how anyone was saved, and all the tumult and resistance that followed his putting up (or sending out) his theses actually helped push him toward his eventual solution, which was that salvation comes by faith alone, and at the instigation of God, not our own efforts. If you think that’s true, then sure you’d think he was right. If you don’t, then you wouldn’t. Incidentally (the kids love asides), Luther wasn’t the first guy to come up with that solution: he was heavily influenced here by Augustine, who was influenced by Paul, and various other thinkers had been influenced by Augustine as well and come to very similar conclusions as Luther’s. What was different this time around was not just Luther’s strong personality, which made him refuse to recant and which made him (unlike others) see his solution as general rather than just personal, but all the new circumstances of the time, that we won’t get into tonight (sounds of disappointment from all). Anyway, if you’re thinking here of a specifically Mormon angle, Margaret, then you might want to sign up for my Reformation class someday (sounds of glee and anticipation), where we actually take a little time to compare the ten or so major points of the Reformation to modern-day Mormonism, and we usually see that Mormons today are in a broadly cultural sort of way a lot more like Catholics than they are like Protestants—in fact 9-out-of-10-points more like. Maybe earlier Mormons had more in common with the Reformers, but not now. Teancum (dressed as the even more radical Jan van Leyden): Then why would non-Protestants celebrate Reformation Day at all? The Whole Still-Growing Crowd: For the costumes and lectures and general love of religious knowledge obviously! Me (sheepishly): Anyone want any candy? All (laughing hilariously): As if! No way, your words have been sustenance enough! Thank you. Happy Reformation Day to you. Now where’s the chocolate. Liked: 1) that Luther “was still working out” and “he hadn’t completely worked out yet” – must’ve been “leg day” my kind of guy, 2) that Mormons are more like Catholics than like protestants – today, 3) trepidation of parents about “beer talk” on Reform. day, 4) indulgences seemed like a straight financial transaction (not any different today), 5) That my brother does something different on All Hallows Eve/Reformation day than just passing out sugar and fat sustenance! Que bien hermano, y que tengas un buen dia de Reformacion! Toilets?? Ah, hoist on your own petard, you are! Chamber pots, maybe. But no toilets in Wittenberg in 1517! But, terrific! What a precocious bunch of kids in your neighborhood! Thanks Julie and Carrie. David nice workout; I suppose it’s sort of up to both giver and receiver in that whole process too… And Mark B. you’re right, a more accurate modern term would be outhouse or latrine or something, or in their lingo the privy. Mostly just a hole, but if inside with “walls” around then needing a little tending…. So … Mormons should like Halloween (with all its salvation-for-the-dead implications) much better than Reformation Day (with its attempt to suppress such) right? Steve, sure, Luther eventually didn’t love All Saints Day, but he was definitely in favor of salvation, so you could say it’s a tossup. I’m tired of all the Reformation-loving kids trampling the flower beds. Ha ha, Paula, and Dave, except these little Reformation-day celebrators would know that Luther almost certainly didn’t actually say that. He wrote down his whole speech, and those words aren’t in it. Someone else added those words, later. And sure maybe he said them and that person was just fixing things, but odds are, alas, he didn’t, and so they’ll have to find another excuse for standing in the flowers. Thanks theoldadam. Herrlich! Wish the kids in my neighborhood were this magnificent, right down to sweet little Teancum. Terrific! Thanks for this. Interesting and funny, too. Excellent, Craig. That is one event we’ve never seen in Catholic Belgium. Any suggestions for a Counter-Reformation Day? Came to T&S for OT lesson material, got this instead. Maybe I’ll teach this in Gospel Doctrine tomorrow. Fabelhaft. Just curious, out of the 95 theses, how many did Luther ultimately win on in regards to the present day Roman Catholic Church? I read this just before going to bed last night and woke up chuckling about it and with a question in my head: any hecklers in your Reformation Day crowd — you know, neighborhood troublemakers who dress up as Johannes Tetzel, pope Leo X, emperor Charles V, Erasmus, Thomas Murner or other nemeses? That would be awesome, although it might increase the chances of questionable language and possibly vandalism. And anyone brave enough to dress as Luther himself? You’d probably have to invite that kid in to sit in your inquisitorial comfy chair. Mostly just wanted to say thanks for such a hilarious and rich post. Oh, this is awesome beyond belief. I always tell my students that, instead of asking for candy when they knock doors on 31 Oct., they should make a statement! Wilfried, well maybe the opening of the Council of Trent: 13 December 1545. Though maybe adjusted by 10 days for the new calendar that would come a few decades later. Which would make it 23 December, so your choice. But then so much else going on that time of year. Or July 31, Ignatius Loyola day. Or Teresa of Avila, 15 October. But the trick of course is to line up with an already existing well-known celebration, so that most people are celebrating one thing but then a brave few are celebrating something else! So maybe Christmas (Christ Mass) would fit the bill. Sometimesacactus, shame on you for goofing off when you’re supposed to be preparing a lesson. The Inquisitorial comfy chair can probably be had in the surplus supply room of wherever Monty Python filmed its memorable sketch. No Luther costumes, though that’s surely because he’s just too obvious, and the kids wanted a challenge. And as I noted, it’s okay to come as Catholic figures too, though Tetzel might get “accidentally” pushed off the porch. Randolph, that would be very hard to identify, since the church didn’t give in on indulgences, but tried mostly to clean up abuses, and since the present-day church is so much different, and I haven’t bothered to compare because there are after all 95 of them. Jason K. not just any old statement, of course, but a debatable-assertion type statement. “No Luther costumes, though that’s surely because he’s just too obvious” — unless Luther were lurking in the back dressed as Junker Jörg. So many possibilities for nerdiness!